By Aaron Doyle | April 1, 2014. 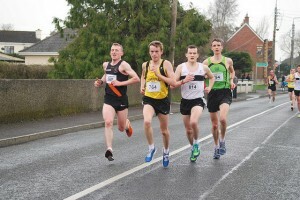 Athlectics club Donore Harriers clinched both the men’s and women’s team prizes at the Eirgrid Dunboyne 4 mile run in Co. Meath last Sunday, 30 March . The men’s team won the team event after beating Raheny Shamrocks by 12 points while the women’s team beat Tallaght A.C. by 29 points. In the men’s competition, the first Donore Harriers man to cross the line was Lee Van Haeften in fourth place after finishing the race in 19:44. The next Donore man to cross the line was Ray Hynes who came seventh and 11 seconds behind Van Haeften. Raheny’s four scorers crossed the line before Donore’s third scorer, Graham Hopkins, crossed the line in 27th position in the men’s race and 29th overall. Hopkins finished the race in 21:41, which was enough to give Hopkins second place in the men’s Vets competition. Des Tremble also did well in the Vets competition, coming third after finishing the race in 22:07. The final scorer for the Harriers was William Morris who was the next man to finish the race. Morris finished 32nd overall with a time of 22:01. When their scores were added up, it emerged that Donore had won the race after scoring 66 points compared to Raheny’s 78, while host club Dunboyne took third place. In the women’s competition, the first Harriers athlete to cross the line was Anne Curley. She finished 6th in the women’s race and 79th overall with a time of 24:17. She also finished second in the women’s vets competition behind former Irish international, Catherina McKiernan. Karen Behan was the next woman for the Harriers to cross the line. She came 16th in the women’s race and she finished the course at a time of 26:10. Aishling Swaine was the third finisher for Donore after finishing the race in 27:04. It was enough to give her 23rd in the women’s race. The final scorer was Samantha Conroy after she finished in 26th position with a time of 27:14. This was enough to give Donore 71 points which gave them the win in the team event. White Collar boxing wants you!